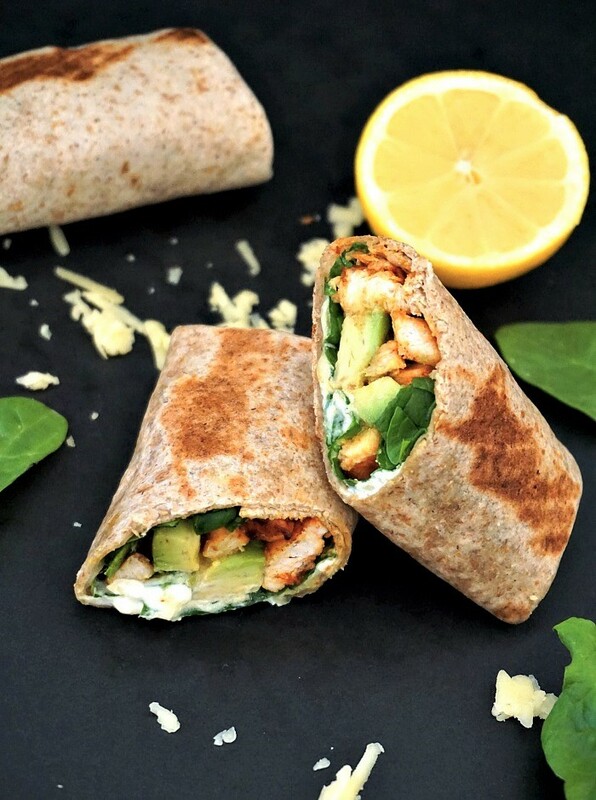 Healthy Grilled Chicken Avocado Wrap with spinach makes a quick easy chicken recipe that is healthy, nutritious and delicious; especially when time is short and preparing a big meal is not an option. A great low-carb, high-protein recipe for weigh loss. New Year, new resolutions. And the most famous one: losing weight. I know, December was a hell of a month, too much shopping, eating and drinking. So a healthier January may sound like a good plan. Although in reality statistics show that the eating healthily doesn't really last that long around this time of the year. Oh well, at least we try. How to make a chicken and avocado wrap? But you know what, quick healthy recipes can be truly delicious and super easy to make. Take this wrap, it has got the healthiest stuff you can ask for: avocados, known for the countless health benefits spinach, a super leaf loaded with vitamins and minerals chicken, an easy and light meat that can safely be consumed if you are on a diet. Chicken can be replaced with any lean meat, like turkey. I have tried it in this Healthy leftover turkey wraps with cranberry sauce and it was really delicious.